Colombian emeralds: High quality, untreated, astrological, jyotish gemstones. Emerald is the astrological, precious gemstone related to Mercury, which is the planet of intelligence, speech, communication, trade and commerce. It improves learning abilities, communication and clairvoyance and it is beneficial to the nervous system. 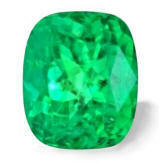 Wearing an emerald of at least 1.5 carat is said to give good results in all the business and trade activities. It is ideal for people working with computers. It makes the wearer more focus in completing many tasks at once. And it will also make the wearer a very persuasive speaker. 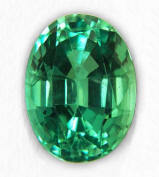 Emerald can be substituted with peridot, green tourmaline, or chrysoprase of at least 3 carats. If you want to know more about the gemological, astrological and healing benefits of emeralds, click here. Important: Important: The following pictures are highly magnified (30X) and do not show the gems' real size. Color and brilliance can greatly vary from computer to computer, depending on your monitor's settings. Color will also, naturally, vary from sunlight to indoor, incandescent light. Dark and lighter areas are effects from the digital camera. See description for accuracy on clarity grade, color and exact dimensions in mm. 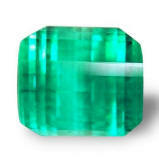 All Colombian emeralds are routinely treated with cedar wood oil and/or permanent resins. It is assumed that our emeralds below are treated so (except when stated untreated/unoiled). 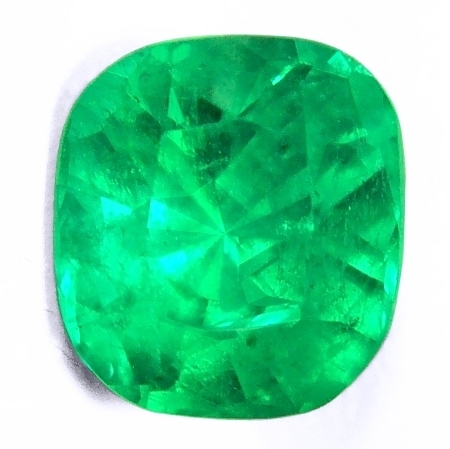 Zambian emeralds are usually less treated. Very beautiful color, minor to nil enhancement, auspicious Zambian emerald for Vedic astrology. $486/ct $1,450/gem Great Vedic emerald this one. It is of Zambian origin, with great color & clarity. 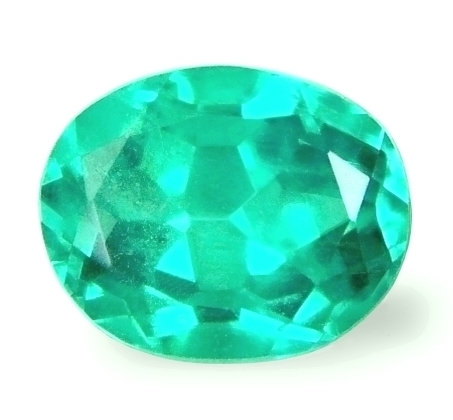 It weighs 2.98 cts., medium-dark, intense, strongly bluish-green color, well crafted, oval cabochon cut, and measuring 10.00 x 7.55 x 5.55mm, good to excellent clarity for emeralds, VS2-SI1 type3, from the emerald deposit in Zambia. The color is great, the clarity very good for emeralds, with at the most some minor oiling, but most likely untreated, and great size too, in all, destined to make a gorgeous Mercury, Jyotish talisman, either ring or pendant, to propitiate Mercury. Rare, minor to nil enhancement, super clean, Zambian emerald for Jyotish. A super clean, very, very lovely, probable no oil to minor, Zambian emerald up for grasp. It weighs 1.08 cts., medium, strongly bluish-green color, well executed, oval, mixed cut, and measuring 7.24 x 5.33 x 4.62mm, perfectly eye clean, VVS2-VS1 type3 from the emerald deposit in Zambia. The stone is a bit deep, therefore it has a small face for its carat weight. But luster is then just perfect (as they say win some, loose some), and together with the fantastic clarity and no reaching surface fissures, which makes it a probable untreated candidate, this is a great stone & a great buy at this low price. Cannot believe we can still offer, luckily, these gems at these prices in 2019. Uniquely cut, super, super clean, Colombian "Chivor" emerald. $1,086/ct $3,250/gem This one is an unique, super clean, Colombian emerald. 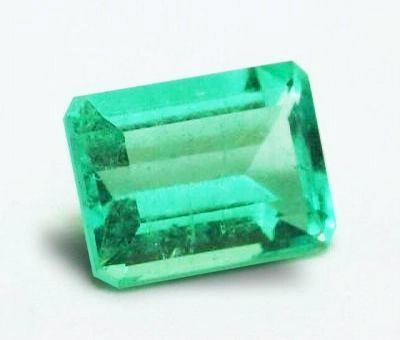 It weighs 2.99 cts., medium, bluish-green color, nicely executed, emerald, "barrel", mixed cut shape, and measuring 8.80 x 7.55 x 5.77mm, an exceptional clarity for an emerald, completely eye clean, VVS2 type3 in clarity, from the famous Chivor mine, Colombia. If you want an auspicious emerald for Jyotish purposes, consider this eye clean Chivor emerald. Superb & rare clarity, one-of-a-kind cut that delivers an austere & propitious luster, overall a rare find and guaranteed to bring the favors of Mercury in you life.. Very crystal with great luster, good shape and well cut, Colombian emerald. $573/ct $975/gem Well, while the picture is good enough, this Colombian emerald in real life is better than the pic. It weighs1.70 cts., medium-light, "spring" green color, perfectly executed, drop, mixed cut shape (pear shape), measuring 9.00 x 6.50 x 5.68mm, very good crystal (more crystalline than pic), VS2 in clarity type3, from the La Pita mine, Colombia. A very sweet, in real life cleaner than pic and surely modest in price for somebody on a budget that still will want a good looking & auspicious Mercury emerald. Very beautiful, large size, perfect cut, Colombian emerald. Alluring emerald this one. It weighs 3.27 cts., medium, slightly yellowish, "spring" green color, very well executed, antique cushion, mixed cut, and measuring 9.13 x 8.33 x 6.68mm, good crystal, VS1 in clarity type3, from the famous Coscuez mine, Colombia. Great size, awesome presence, good crystal with not surface reaching fissures, and possessing an antique cushion shape that needless to say, it is rarely cut in emeralds. 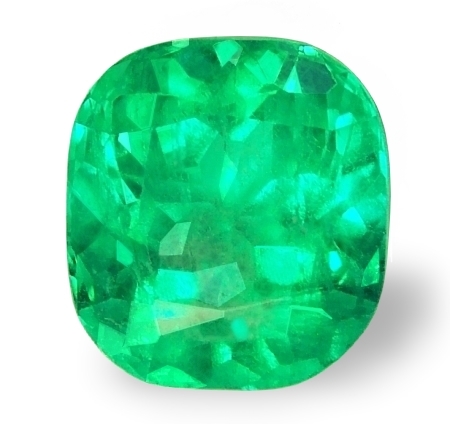 Overall, a great Colombian emerald sure to set gorgeous in any setting you will desire. Great price as well. Seductive, eye clean and well cut, Colombian "Chivor" emerald. What a beautiful Colombian emerald! It weighs 0.99 cts., medium, bluish-green color, very well executed, round, mixed cut, and measuring 6.62mm in diameter x 4.21mm deep, very crystal, super clean, VVS2-VS1 type3 in clarity from the famous Chivor mine, Colombia. While La Pita area mines produce a good 60 to 70% of all the output of Colombian emeralds on the market, and Muzo is the most well known of all the Colombian emerald type, it is Chivor that it is the most esteemed especially among emeralds connoisseurs & aficionados because of its unique & gorgeous bluish-green color and high clarity. This one will set fantastic in any setting and guaranteed propitious. Very showy large size, perfect emerald cut shape, good clarity, Colombian emerald. $590/ct $3,250/gem Large emerald here. It weighs 5.50 cts., light, "verde agua" green color, perfectly executed, emerald, step cut shape, and measuring 12.97 x 10.00 x 5.92mm, good cleanish crystal, the usual minor inclusion for such large size, VS2 in clarity type3, from La Pita mine, Colombia. If you are looking for an impressive size, good Jyotish clarity and an overall exotic and auspicious Mercury emerald that is guaranteed to set great in anything you will think of, consider this one. Pool-like crystal, classic shape, good size, Colombian emerald. $1,033/ct $2,500/gem Classic shape, Colombian emerald weighing 2.42 cts., medium-light, spring green color, with a subtle yellowish undertone, perfectly executed, classic emerald, step cut, and measuring 8.83 x 7.74 x 6.15mm, good crystal, good clean, VS1 (Permasafe treated meaning treated with permanent resin) type3, from La Pita mine, Colombia. Great crystal clarity and a most perfect cut that delivers great luster and sweet eye appeal. Will set great in any setting you will decide on. 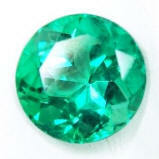 Simply amiable, very clean with great color, Colombian emerald. $821/ct $895/gem Do not judge from the very magnified pic. This is an eye clean Colombian emerald, It weighs 1.09 cts., medium to medium-dark, vivid, "summer" green color, well executed, oval, mixed cut, and measuring 7.00 x 5.73 x 4.53mm, very clean crystal, VS2 type3 in clarity, from the Totumos mine, Colombia. Awesome emerald with a great color and fine clarity. Like the rest of colored gemstones, now prices are very high. Yet, We are still the Jyotish dealers with the lowest wholesale prices. This is a great Colombian emerald, with very, very minor enhancement to nil, surely to make an auspicious Vedic talisman of sweet beauty. Super clean and with beautiful color, uniquely cut, Colombian emerald. $1,084/ct $900/gem Awesome Colombian emerald this one, It weights 0.83 cts., medium-dark, vivid, very slightly bluish, "summer" green color, very well executed, marquise, mixed cut shape, and measuring 11.68 x 4.22 x 3.2mm, eye clean, VVS2-VS1 type3 in clarity from the Totumos mine, Colombia. Have it set in our signature granulated pendants or rings and see what very little money can do. Emeralds when set in high carat yellow gold just flourish tenfold like no other colored gemstone. Absolutely luscious, clean and definitely exotic. Luscious, super clean and with awesome color, Colombian emerald. $924/ct $1,100/gem Alluring Colombian emerald, weighing 1.19 cts., medium to medium-dark, vivid, very slightly bluish, "summer" green color, very well executed, marquise, mixed cut shape, and measuring 13.08 x 4.87 x 3.37mm, very clean crystal, VVS2-VS1 type3 from La Pita mine, Colombia. Beautiful emerald with luscious color and fine clarity. Great cutting as well, a marquise, mixed cut shape that is simply unique and enthralling. We are direct importers, so rest assured our prices cannot be beaten for the quality offered. 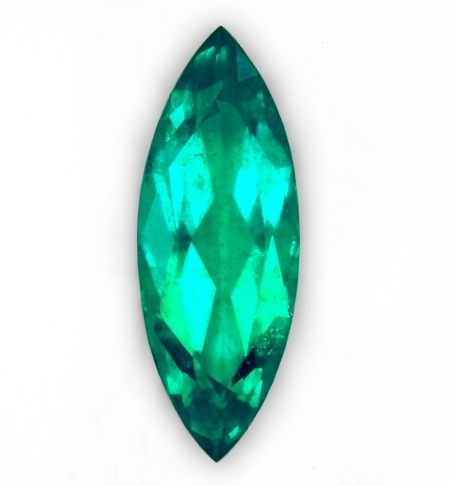 Let us make a beautiful and unique jewel for this beautiful Colombian emerald. We will not disappoint you with our custom jewels. 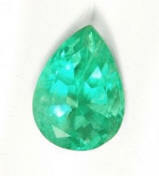 Tantalizing, perfect drop shape, great luster & clarity, Colombian emerald. $873/ct $1,450/gem Classic color in this Colombian emerald, weighing 1.66 cts., medium, intense, v.slightly bluish, spring green color, perfectly executed, drop, mixed cut shape, and measuring 9.87 x 6.20 x 5.04mm, very clean crystal, VS1 type3 from the Gachala' mine, Colombia. 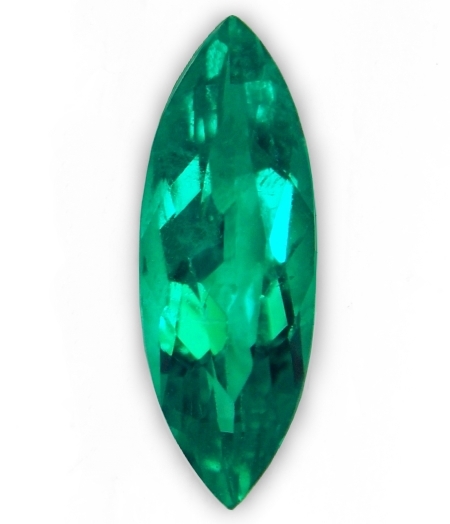 Very charming and well cut, Colombian emerald drop shape that is lustrous and with appealing medium color. Either ring or pendant, this baby will set beautifully. Well shaped, very clean, definitely sweet, Colombian emerald. $637/ct $650/gem Again, not a great pic showing the clarity. This emerald weighs 1.02 cts., medium, very slightly bluish, "spring" green, well executed, antique cushion, mixed cut, measuring 6.64 x 6.01 x 4.66mm, good, eye clean crystal, VS2 type3 in clarity, from La Pita mine, Colombia. I like this emerald, an antique cushion shape that is just plain nice, and the best part is the affordable price. By buying at origin in Colombia, we can offer great prices that are at true wholesale value. Beautiful, well shaped with great face, good ring size, Colombian emerald. $691/ct $1,190/gem I love this Colombian emerald. It weighs 1.72 cts., medium, slightly yellowish, "summer" green color, very well executed, antique cushion, mixed cut, measuring 8.31 x 7.26 x 5.33mm, good clean crystal, VS2-S11 type3 in clarity, from the famous Coscuez mine, Colombia. With prices for quality emeralds off the roof, this Coscuez emerald is a great buy. Very well cut, with great spready face, good transparent clarity with minimal "jardin", exotic & luscious eye appeal, it is guaranteed to set very well, either ring or pendant. Ask for our custom settings. Set yourself apart. Very sweet, super clean and well cut, Colombian "Chivor" emerald. If you want a Mercury stone that is really beautiful and surely auspicious, consider this Chivor, Colombian emerald, weighing 1.54 cts., medium (to medium-light), slightly bluish, "verde agua" green color, perfectly executed, oval, mixed cut, and measuring 8.19 x 6.60 x 4.90mm, super clean crystal and eye flawless, VVS2-VS1 in clarity, type 3 gemstone, from the famous Chivor mine, Colombia. The pic does not do any justice to this very beautiful, perfectly cut and clean Chivor emerald. Sure to mount exquisite in any setting you will choose. Bought it well from a friend this past July 2017, that I met many years ago, a true Esmeraldero having quality stones at great prices. Pristine, well cut & clean, Colombian "Chivor" emerald. Very auspicious emerald for Jyotish & Vedic astrology. $836/ct $1,180/gem I love this one! A very beautiful, and clean, Colombian emerald, weighing 1.41 cts., medium medium (to medium-light), slightly bluish, "verde agua" green color, well executed, round, mixed cut, and measuring 7.33mm in diameter x 4.67mm deep, VVS2-VS1 type3 in clarity, from the famous Chivor mine, Colombia. A very clean emerald, very lovely with an also rare round cut, and sure to set great in any setting. Have us to design your planetary talisman for good luck, support of nature and eye beauty. 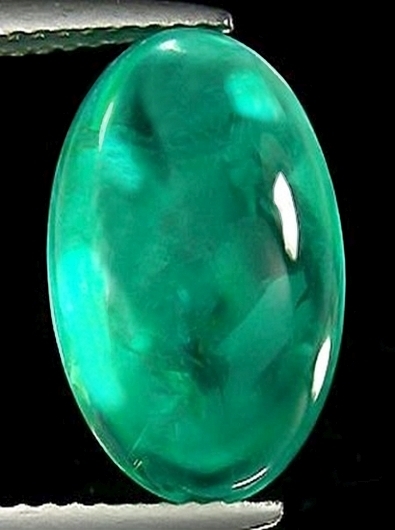 Very beautiful, large size, Colombian emerald cabochon. Great buy. $191/ct $1,180/gem A very beautiful, and large faced, Colombian emerald cabochon, weighing 6.15 carats, medium, "spring" green color, slightly bluish in undertone, perfectly executed, elongated, oval cabochon cut, and measuring 14.58 x 9.22 x 6.80mm, very good translucency, SI3, from La Pita mine, Colombia. Great face and super pleasing look Colombian emerald cabochon, with excellent translucency and an appealing medium spring green color. Will set perfectly luscious and royal in any setting you are thinking of. 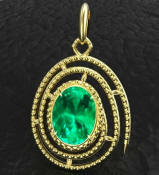 Utterly unique, 14KY gold, Mercury pendant with oval shape, Colombian emerald. 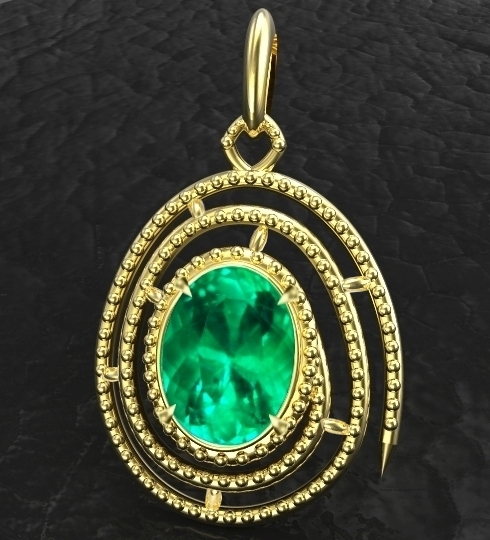 $1,395/pendant Our signature, the spiral, 14K yellow gold, Mercury Jyotish pendant, featuring a Colombian emerald, weighing 1.27 cts., medium, vivid, very slightly bluish, "summer" green color, perfectly executed, oval, mixed cut, and measuring 8.04 x 6.01 x 5.07mm, very clean crystal, VS1-2 type3 in clarity, eye clean, from La Pita mine, Colombia. La Pita mine is probably the most prolific of all emerald mines in Colombia. 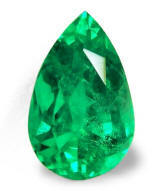 A lot of emeralds on the market are mined in its underground shafts. And it produces all sort of qualities, from the "murralla", or opaque low qualities, to the finest, clean & top color qualities. This one does not need comments. Great stone, super clean, great color, one-of-a-kind pendant. The emerald gemstone remains one of the most popular gems today and is one of the rarest and most valuable precious stones. It is important to know that all emeralds have inclusions and there is no such thing as a flawless emerald. Our yearly trip to Colombia allow us to hand picked, vibrant and beautiful Colombian emeralds at prices that nobody can beat. 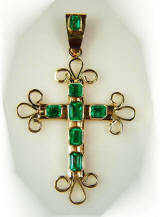 Very elegant & unique, Spanish style, 18KY gold, Colombian emerald cross. Really beautiful. $900/cross Another beautiful, 18KY gold emerald cross, this time mounting 6, beautiful emerald cuts, Colombian emeralds, forming the cross design and 1smaller emerald on the bail, all stones are bezel set, with a total weight of approx. 2.75 cts.. The color is medium-dark, intense green, slightly bluish, all eye clean, from the famous Muzo mine, Boyaca' District, Colombia. This cross is just a fraction smaller than its brother with pear shapes emerald below left..., measuring 1 1/2" in length and 1" wide. It wears simply gorgeous. Great quality, this one is under priced and has no reserve. Stones do not touch the skin, intended for jewelry wear only. 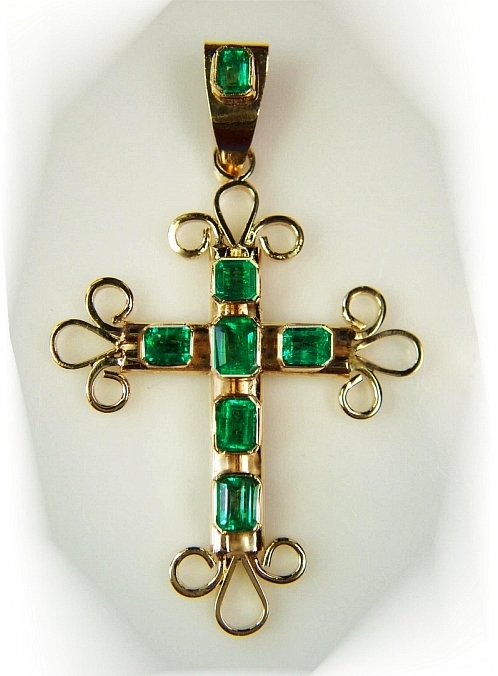 $900/cross Exotic, 18KY gold, Colombian emerald cross, designed & crafted in Medellin, Colombia, in the typical religious style found in central & south America, mounting 6 gorgeous pear shapes, Colombian emeralds forming the cross design and 1smaller emerald on the bail, all bezel set. The cross itself measures a bit over 1 1/2" (inches) in length and 1" wide. Estimated total weight of emeralds around 2.5-2.75 cts., top, medium-dark, intense green, very slightly bluish, eye clean from Muzo, Boyaca' District, Colombia. Truly a great piece, with quality, dark green emerald, and at a give-away price.Stones do not touch the skin, intended for jewelry wear only. 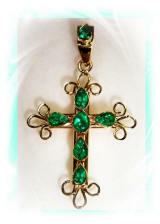 Modern and elegant, 14KY gold, 3-gems, Colombian emerald pendant. $725/Pendant A real nice, well crafted and substantial 14K yellow gold pendant, 5.5 grams in gold, mounting three, completely eye flawless, Colombian emeralds, 0.65 ct. total weight, medium to medium-dark, intense, "glowing" green, slightly bluish, 3.6mm round, diamond cut (very difficult to get eye clean/diamond cut emeralds! ), from the Chivor mine, Colombia. The pendant is 1" long and 1/4" wide and has a hidden bail. Wear it anytime, anywhere, this very wearable jewel is guaranteed to please the eye and uplift your spirit. Well priced, considering that $695 will buy only the heavy gold setting anywhere else. Stones do not touch the skin, intended for jewelry wear. Viewing emeralds the correct way. 1- We have been asked many times how to view correctly emeralds. In a gem box, an emerald will never display its full potential look. 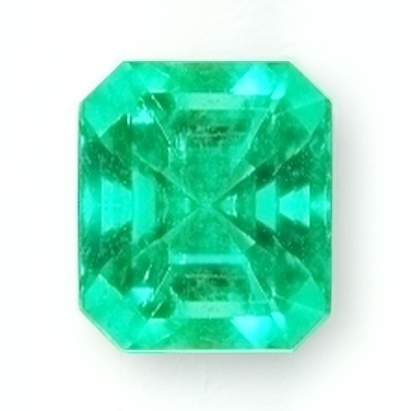 The pic above shows the right way to view an emerald, and see its closest, natural appearance once the stone will be set in a ring or a pendant. Just hold it in between your finger as shown. Having an incandescent light source on in the room, will help also to see the color and brilliance in indoor environment. 2- Colombian emeralds will flourish when set in high karat yellow gold (As a matter of fact, in Colombia, goldsmiths will refuse to set any emerald in white gold.). In 18K high carat gold, emeralds will just beautify their appearance tenfold. 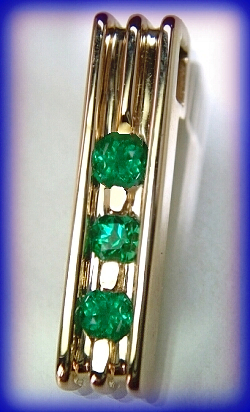 No other colored stone will flourish so much, when set in a high karat yellow gold setting like an emerald does. 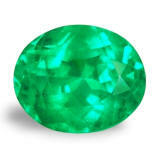 1- DO NOT USE ANY ULTRASONIC CLEANER OR STEAMER when you set or clean your emerald. Ask the jeweler that will set your emerald, not to use the buffing wheel to polish the ring or pendant, once the stone is set. The setting should be high polish before setting the emerald. Once the stone is set, the jeweler should just polish the prongs or bezel with the hand piece, without going over the stone in any way. Avoid rapid temperature changes and high heat sources. 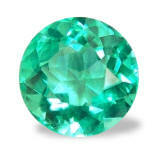 2- Clean your emerald periodically (when it is less lively and sparkling) with cold water and a mild soap. Perform this operation with the help of a soft toothbrush. Clean it well, rinse it and dry it. Avoid rapid temperature changes and high heat. 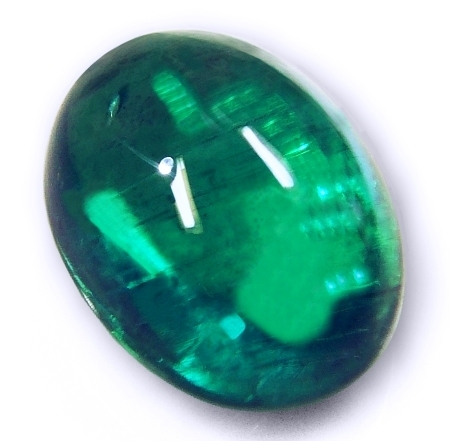 3- Emerald is a hard gem, which is however brittle. Make sure to remove your emerald ring before any heavy activities such as washing dishes by hand, or working with tools. A hard knock can break your emerald.